After directing the first two entries in the Star Trek feature film reboot, Star Trek and Star Trek Into Darkness, J.J. Abrams assumes Executive Producer duties and hands over the directorial reins to Justin Lin who has been known mostly for his work on the Fast and Furious franchise. While Lin is careful not to stray too far from the visual groundwork laid down by Abrams that has made the franchise commercially viable once again at the box office, he does bring his own sense of kinetic energy into mix. The result is a Star Trek film that hearkens back to the some of the campiness of the original series while having the edge of the Abrams films. The problem is there is a certain lack of cohesion that makes the story in Beyond take a back seat to the visual elements and the action pieces. 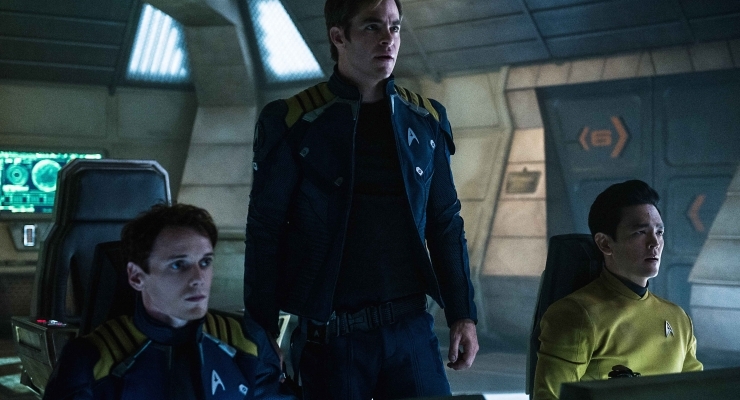 This time out, the crew of the USS Enterprise, once again helmed by Captain Kirk (Chris Pine) is already three years into their five-year mission, but the perennially restless Kirk is going stir crazy. Not enough seems to happening for him, so he wants to be removed as Captain and move on. He wants Spock (Zachary Quinto) to takeover command from the next mission of the Enterprise crew of Uhura (Zoe Saldana), Scotty (Simon Pegg), Sulu (John Cho), Chekov (Anton Yelchin), and all the other members of the Starfleet flagship. Then, in classic Star Trek fashion, while the ship is in dry dock at Yorktown refreshing rations and taking some much-needed downtime, a distress signal comes in from an uncharted area of space. Off to the rescue it is. The Enterprise finds itself in the middle of a swarm of bee-like spaceships at the command of a tyrannical alien named Krall (Idris Elba) attacking the vulnerable ship. The mystery being, out in this uncharted area of space, how is the despot Krall as familiar with humans as he appears to be, and why is he out to get them? Krall is in search of a dangerous weapon, which he manages to steal. The Enterprise crew with the help of a native alien from the region, Jaylah (Sofia Boutella), must escape from Krall and stop him from using the weapon to kill millions back at Yorktown. Justin Lin’s direction is so hyperactive, that people could be excused for mistaking Star Trek Beyond for the visual portion of an amusement park ride. It’s big budget, big special effects, and big action that has a lot of allusions to the original Star Trek series visually and thematically, but its character development and story miss the basics of what Star Trek was all about. Social commentary in a sci-fi setting is missing, apart from a scorned villain who seems upset about something having to do with wars and his treatment as a veteran of them. The Star Trek franchise may be heading right back down the same road that had its cinematic franchise in trouble for years in the first place, and it isn’t something symptomatic of this particular franchise. It is a symptom of Hollywood and the industry. The reboots, rehashes, remakes, shameful budgets, and sacrifices of stories that mean anything at all, all in search of more and more butts in the seats mean almost everything that comes out feels tired and old hat from the first teaser trailer. Star Trek Beyond is just another part of the problem. Read our own Gerard Iribe’s theatrical review of Star Trek Beyond for a different perspective. I was sent a copy of the Blu-ray 3D Combo Pack of Star Trek Beyond. The film itself was shot at 3.4K on the Arri Alexa XT with Zeiss Master Anamorphic, Master Prime, Ultra Prime, AUWZ and Angenieux Optimo 2S lenses and some scenes in 6K with the Red Epic Dragon with Zeiss Compact Prime lenses. A 2K digital intermediate was used. The 3D version is a conversion, so no native 3D and, in fact, the 4K Ultra HD version available is being taken from the 2K master, although the biggest benefit there will most likely come from HDR. The 3D conversion is good, but certainly not as good as native 3D. Having recently re-watched Gravity in 3D, which is mostly a native 3D production, I can instantly see the difference. 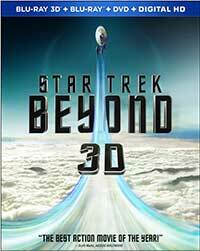 Star Trek Beyond 3D adds some depth of field, but it is not as impactful, nor does it have the pop-out that true 3D does. The real star of the show here is the 2D transfer on Blu-ray, which is so clean and crisp with magnificent shadow nuance and no noise. Star Trek Beyond arrives on both the Blu-ray 3D and 2D Blu-ray discs with an English Dolby Atmos sound mix (Atmos is backwards compatible with Dolby TrueHD and will playback as Dolby TrueHD 7.1 on non-Atmos systems), but before you get excited, there is something amiss with this mix. First off, the Atmos mix is just average, you don’t get anything that couldn’t be accomplished just as well or better with a 5.1 or 7.1 mix. I just re-watched much of Gravity 3D the other night and the non-Atmos mix on that 3D disc was far more encapsulating than the mix on Star Trek Beyond. Now for the really bad: for a film with a lot of explosions and impacts, the low end just isn’t there. It seems to just come and go. Maybe this is some odd form of artistic intent meant to remind us that the vacuum of outer space doesn’t really have any sound, but even on the planet with Chekov and Kirk, around the 46-minute mark as the old starship saucer section drops and lands with what should be a colossal impact, it hardly makes a thud. Skip forward to the final act at about an 01:33:00 during the big space battle and there is very little deep low end, only a few moments with the LFE sneaking through, but the mix seems to stay in the upper low end and midrange. Apart from that, the sounds move around nicely, except the aforementioned lack of good use of the extra Atmos channels, and dynamics seem to be good. Dialogue is clean as well. Paramount fills out the disc with a decent amount of featurettes and interviews with the cast and crew, plus two tributes, one specifically to late actor Leonard Nimoy and one for both Nimoy and the late Anton Yelchin. A Warped Sense of Revenge (1.78:1; 1080p/24; 00:05:15) – This featurette looks at the menacing villain Krall and his portrayal Idris Elba. Trekking in the Desert (1.78:1; 1080p/24; 00:03:06) – The crew discuss scouting various locations before settling on the ultra-modern Dubai which fit into the world of Star Trek easily. To Live Long and Prosper (1.78:1; 1080p/24; 00:07:51) – A tribute to Leonard Nimoy and the character of Spock. For Leonard and Anton (1.78:1; 1080p/24; 00:05:04) – Remembering the two actors who have passed away. The third installment of the rebooted Star Trek franchise may not let down on action and visual effects, but that is basically all it delivers on. That said, the film looks great on Blu-ray, decent on 3D, but doesn’t sound anywhere near reference with its Atmos mix. Justin Lin brings the hyperactive energy that is his signature in the Fast and Furious franchise to Star Trek Beyond, but the film fails to deliver a coherent storyline. The Blu-ray release also delivers a disappointing Atmos mix.